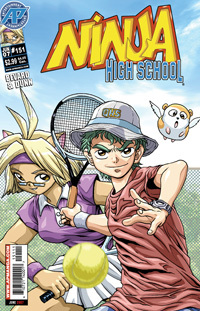 Tennis prodigy Pete is unmatched in his skill at the game, a true Monarch of Tennis, even in a town full of ninja, demons, catgirls, and superpowered beings. Now he's being pushed into entering Quagmire High's elite tennis club by the legacy of his former-tennis-star father, but Pete wants nothing to do with it. Instead, his goal is to wash dishes in every state of the country, which is why he got a busboy job at the Sakura Inn! Can a wily coach get Pete to enjoy his specialty sport, or will he deny his talent to become the world's greatest dishwasher? !